Traditions while going to the Washington state track and field meet do not necessarily need to include getting trapped in or running (perhaps being chased) down the halls of Stadium High School, but they surely include telling the stories. 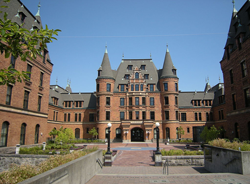 Our school’s state track and field tradition includes a trip to historic Stadium High School in Tacoma, where governors and Supreme Court justices have attended. We usually just go to look at the building with its plaque. And of course, we look at the stadium itself. The plaque tells about Stadium’s storied history. It was supposed to be a train station and hotel except that the railroad went bankrupt before it ever opened. Then, there was a fire. The building sat empty and was even being dismantled until the Tacoma School District bought it in 1904. Since then, it has undergone remodels and renovations. It is now a registered historic building. The stadium is a wonder too and has its own story. It looks like any other football field, but the stadium is unique. It appears to be carved out of the hillside overlooking Commencement Bay. The million dollar views that can be seen from the building can also be seen from the stands. Auspicious events and important dignitaries, including U.S. Presidents Woodrow Wilson, Theodore Roosevelt, and Warren Harding, made appearances there. It is interesting to look at the track around the field too. Actually, it does not go all the way around the field in the typical oval shape. It just stops. Apparently, the hill fell away and a turn of the track was taken with it. But the concrete stands remain to tell the stories of more than just the games that are still played there. As we stood there looking at the stadium and then the courtyard of the beautiful building, stories of past trips to Tacoma unfolded. Naturally, the stories started with one of sneaking into the building somehow. Anybody who sees Stadium High School from the outside would want to go in. It is just the grandeur of the place. It looks like a castle even to the point where the kids this trip (2014) kept lovingly calling it Hogwarts. So the coaches who had been coaching forever told of how they walked into the building when there was a function happening once or how they found an open door another time. They told of being inside and turning a corner only to find the principal of not just Stadium but of Mount Tahoma (where one of the state track and field meets is held). They told of being stuck in boiler rooms after making too many wrong turns. They told of being locked out of the building on the wrong side and having no way out. They told of another coach sewing ripped pants after finally finding a way out over a fence. And of course, they told a story about running through the halls like fugitives since they were not supposed to be there in the first place. The kids were wide-eyed in the courtyard as we all listened to the true stories of trips from the past. Then, as if on cue, they all started running around to all the doors and windows to see if they might find a way in so that their story might be included in the annals of trips to state. The coaches all tried to stop the crazy search, but to no avail. Then, the unthinkable happened. Somebody found a way in. The four coaches ran to the voices. All the kids were crowded at the bottom of a stairwell. A man (who shall remain nameless) was standing with the door open with his body barring the kids from entering. When the coaches all gathered at the top of the stairwell, he let everybody in. Chris, the nameless night custodian, was on his lunch break. He said he was willing to give us a short tour since he was off the clock. One of the boys graciously offered that our guide could eat while giving us the tour. Chris just ignored the comment and we started off. It seemed that Chris had only grudgingly agreed to the tour at first. It seemed that he only opened the door in the first place because he could not ignore the exuberance of youth or perhaps the pleading eyes of youngsters. As we climbed up and up and up, the kids were in awe of the school. And as we even marveled at the beauty of the staircase, Chris started to warm up to our little band of athletes. The staircase was just the start of the adventure. We went into the topmost classroom in one of the towers of the building. It looked out over the courtyard where we had just been minutes before. The kids peeked out the windows at the views and one even sat in a desk wondering how students could get anything done with the architecture and external views as constant distractions. As we walked down the hallways of the next floor down, the kids marveled at the architecture. Even the tile floors were amazing. The kids fell in love with the building. Then, we got to the theater. The old theater was converted into a two story common area. The lower floor still had the hardwood stage, but the seats which had previously gone all the way up to the floor where we were standing had been removed. Railings on the upper floor let us look down on the stage. We imagined a play being rehearsed or kids just sitting around studying or talking. The kids pointed to the ornate moldings in the theater area and later noticed them again and again as we walked through the building. Our nameless tour guide took us upstairs and downstairs. We saw breathtaking views of the bay. We saw classrooms and conference rooms where it was hard to imagine getting any work done. At the main entrance of the school, we saw pictures of governors, a Supreme Court justice, and other dignitaries who graduated from Stadium. We saw the tiger guarding the entrance and the dignitaries. And we imagined it prowling the halls at night keeping the school safe from unwanted intruders. Our guide took us seemingly everywhere. Then, we got to a darkened cavern in another common area. It was almost the end of the tour and we went down down. We descended into the abyss where nary any light penetrated the darkness. And then, we went out through what seemed like a secret tunnel. At one end of the tunnel we saw the pool. At the other end was a set of gyms and an auditorium, which even though we did not peek in (because there was an event happening), would have held three quarters of our own school population. Then, we went out. Back into the courtyard where we first started. We shook hands with our guide and thanked him profusely for the tour. He had given up his lunch break to show a bunch of strangers his pride and joy. He had walked us through the hallways of his school giving us a lesson on history and hospitality that we will never forget. Back in the courtyard, we marveled about what had just happened. We had come to Stadium High School as part of the tradition of going to the state track and field meet. We had marveled at the beauty of the stadium and the building. We had been regaled with stories from the past. And thanks to a bunch of exuberant high schoolers and a proud keeper of the keys, we had the tour of a lifetime. It might not have been as adrenalin packed as running through the halls of a deserted building and it will probably not make it into the tradition, but surely The Tour will now be part of the annals of visiting Stadium High School.